A dedicated activist who helped forge change in America’s political and economic inequalities, Dr. Caroline E. Spencer was born in Philadelphia in 1861. Following her 1880 graduation from the Philadelphia Normal School for Girls with the Mrs. Hannah M. Dodd Medal of Merit, she taught history at the Normal School before enrolling in the Women’s Medical College in Philadelphia in 1889. After her graduation, Dr. Spencer would practice medicine for most of her adult life. 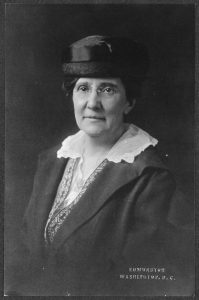 An avid traveler, Dr. Spencer left Philadelphia for Colorado Springs, Colorado where her activism would earn her credit for organizing and managing the state’s most dynamic wing of the women’s suffrage movement. She was among the founding members of the Women’s Club of Colorado Springs (1902) and the Civic League (1909). In 1913, she joined Alice Paul’s Congressional Union/National Woman’s Party (NWP) to boldly and publicly demand gender equality. Between 1917 and 1919, she joined other NWP members in picketing the White House to advocate for passage of the 19thAmendment. She was arrested three times and imprisoned twice. On October 22, 1917, Dr. Spencer, Alice Paul, Gladys Greiner, and Gertrude Crocker were charged with obstructing a sidewalk. They were found guilty, and Greiner and Crocker were sentenced to 30 days in prison. As repeat offenders who were holding the banner, Alice Paul and Dr. Spencer were sentenced to seven months. Following the passage of the 19thAmendment, Dr. Spencer continued to fight against discrimination. During a visit to Philadelphia in 1922, she organized a meeting that led to the creation of the Philadelphia branch of the NWP and in 1924 was instrumental in organizing an NWP rally in Pennsylvania that called for congressional representation for women. Facing a diagnosis of tuberculosis, Dr. Spencer returned to Philadelphia, where she lived with her sister until her death on September 16, 1928. This National Council member of the NWP was inducted into the Colorado Women’s Hall of Fame in 2006 as a bold, courageous woman of the Rocky Mountain West. Colorado Women’s Hall of Fame, http://www.cogreatwomen.org/project/caroline-spencer-md/. The Trials of Alice Paul and Other National Woman’s Party Members: 1917 – Suggestions For Further Reading, http://law.jrank.org/pages/2806/Trials-Alice-Paul-Other-National-Woman-s-Party-Members-1917.html. Doris Stevens, Jailed For Freedom(New York, NY, Boni & Liveright, Inc., 1920) pp. 213, 308, 345, 368. Tim Blevins, Dennis Daily, Chris Nicholl, Calvin P. Otto, and Katherine Scott Sturdevant, editors, Extraordinary Women of the Rocky Mountain West(Pike’s Peak Library District and the Colorado Women’s Hall of Fame, 2000), pp. 245-289. “A Large Graduating Class from the Girls’ Normal School.” The Times[Philadelphia] 18 June 1880: Page 8. www.newspapers.com. 19 May 2018 Accessed. “Obituary.” The Philadelphia Inquirer[Philadelphia, PA] 18 September 1928: Page 8. www.newspapers.com. 19 May 2018 Accessed.